8-Bit Girl: Four Swords Now Available on the 3DS! Four Swords Now Available on the 3DS! The Legend of Zelda: Four Swords Anniversary Edition is now available to download from the Nintendo 3DS and DSi eShop now, and you know the best part of it all? It's completely free. Four Swords was originally bundled with A Link To The Past on the Gameboy Advance in 2002. It gained a Gamecube release soon after, but the Gameboy Advance edition was needed in order to play it via the television screen. 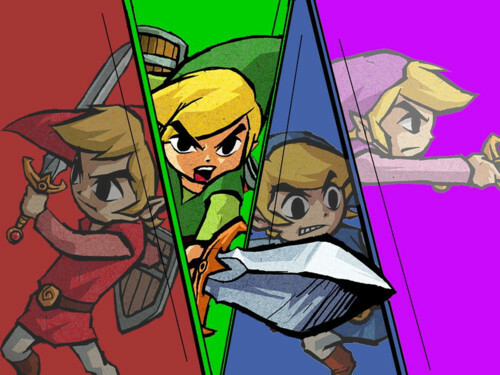 The Gameboy Advance version of Four Swords was the first Zelda title to feature a multi-player experience, and featured four playable (and different coloured) Link's. You and three other players then race to rescue the Princess Zelda from the evil purple haired Vaati. The gameplay follows the typical format of the other games in the Zelda series-traverse your way through dungeons, complete puzzles and collect items. Those expecting a port of the original should note that Four Swords Anniversary Edition differs somewhat. A single player mode has now been included, which allows players to switch between two different Link's throughout the game. Two new areas have also been included. The Hero's Trial area will teach Link the Hurricane Spin, whilst the Realm of Memories apparently features some familiar locations from other Zelda games. A grand reward is collected when this area has been completed. I have fond memories of playing through the original Four Swords with three other friends when it was originally released, and once I get hold of a Nintendo 3DS, I will definitely be downloading this! How about you?